More insurance carriers that cover more of your needs. Serving customers since 1980 all over America. We have products that put money back in your pocket. All your insurance needs from one agency. We know that you want the best coverage, convenience and care for all your insurance needs. With CMI Insurance you can choose a local agent who offers insurance coverage for the things that matter most to you – health, life, car, home, motorcycle, boat, and small business – all from the same agency. 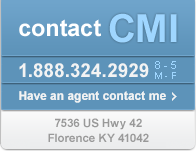 CMI Insurance is committed to helping you with the best service and support from a company that has been awarded as an agency, managers and agents for over 39 years. Whether you purchase a policy or just get a quote, you can count on one of our local CMI Insurance agent's to select coverage that best fits your needs and budget.